Here are some photos showing the flowers and colours of the Wesak Day celebration at the Buddhist Maha Vihara in Brickfields Kuala Lumpur and also the procession as it goes down Jalan Bukit Bintang. We went to Brickfields late in the afternoon, and the traffic was already building up. Fearing that there were no parking spaces available nearer to the Vihara, we opted to park at the Girl Guides Headquarters’ grounds which cost us RM5. It was a short walk to the Vihara, but tolerable. As we got closer to Jalan Berhala, we could see that the Evangelical Lutheran Churh at the corner still have available parking spaces (at a higher price, naturally). Beautiful bouquets of Cymbidiums and Gerberas on sale. Chrysanthemum with candles as offering item. 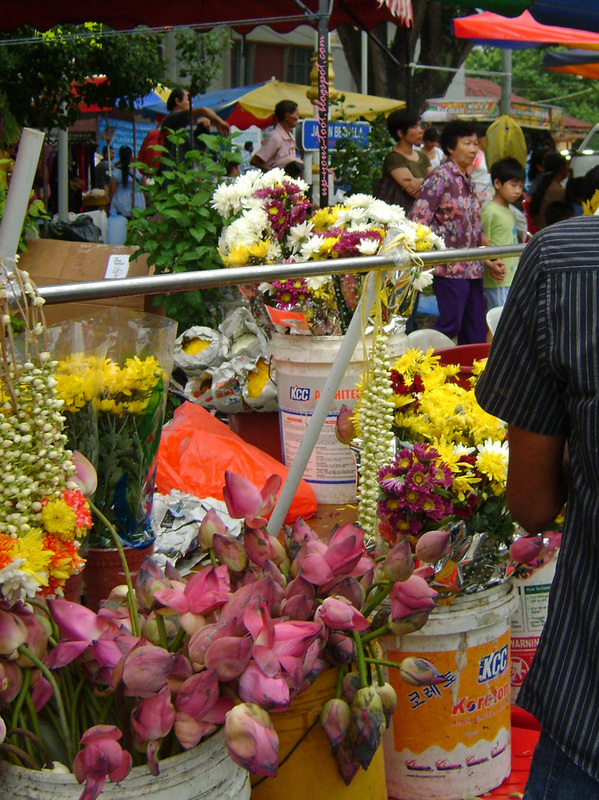 As one turn into Jalan Berhala, the most obvious item that one sees on sale is flowers. There were nice bouquets of gorgeous Cymbidiums with Gerberas and filled with Solidago, Michaelmas Daisies and Dracaena canes. Besides these flowers, Chrysanthemum is another notably visible flower besides the usual Sambac jasmine flowers and roses. 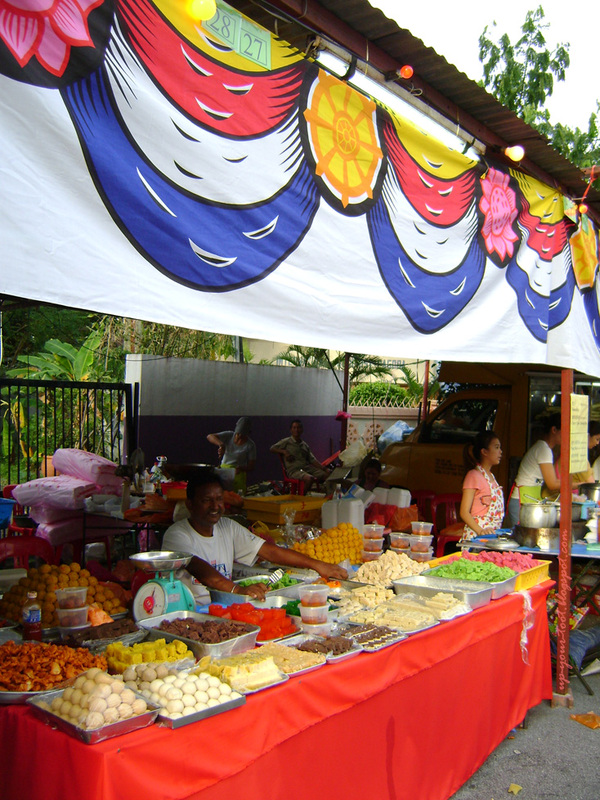 The quintessential Wesak Day flower i.e lotus buds being offered for sale as well as jasmine garlands and chrysanthemums that were snapped up like hot cakes by devotees. The Buddha all ready to paint the town red on a Saturday night in his new ride decked with fake lotus blooms. 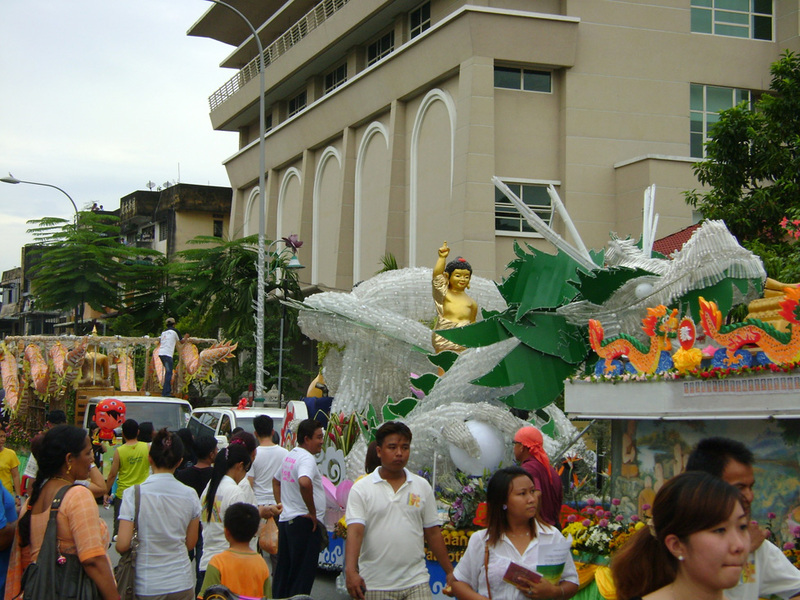 The baby Buddha on a dragon's head, waiting for the procession to start. The dragon can turn its head around and spew smoke from its mouth! 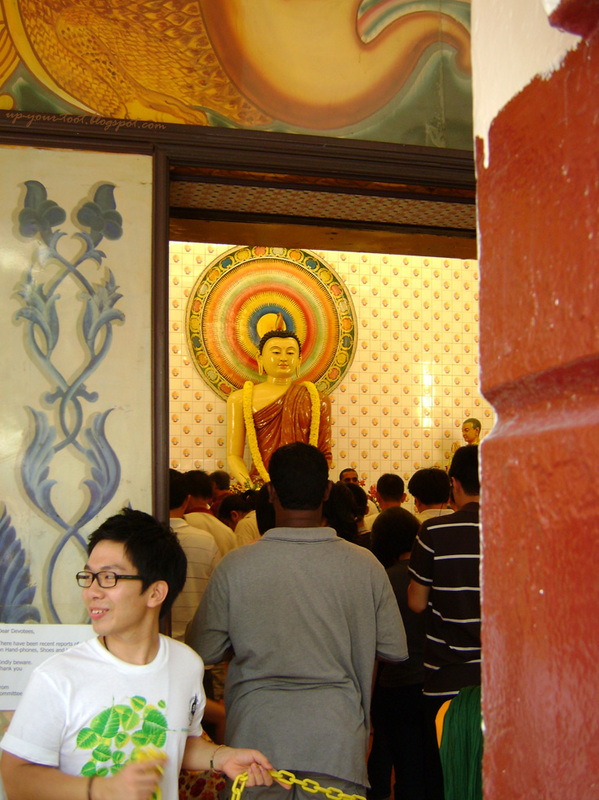 The Buddhist Maha Vihara was filled with throngs of visitors and devotees. From the old to the young, many came to pray and make offerings to the Buddha as well as the monks. The main shrine hall was packed with devotees queuing up for the blessing service. 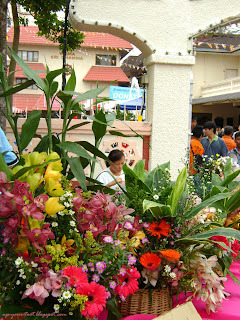 Outside, monks armed with large palm fronds/dracaena were continuously sprinkling devotees who made a line for them. The main shrine hall packed with devotees for the blessing ceremony. Devotees collecting the blessed string after being blessed by monks. 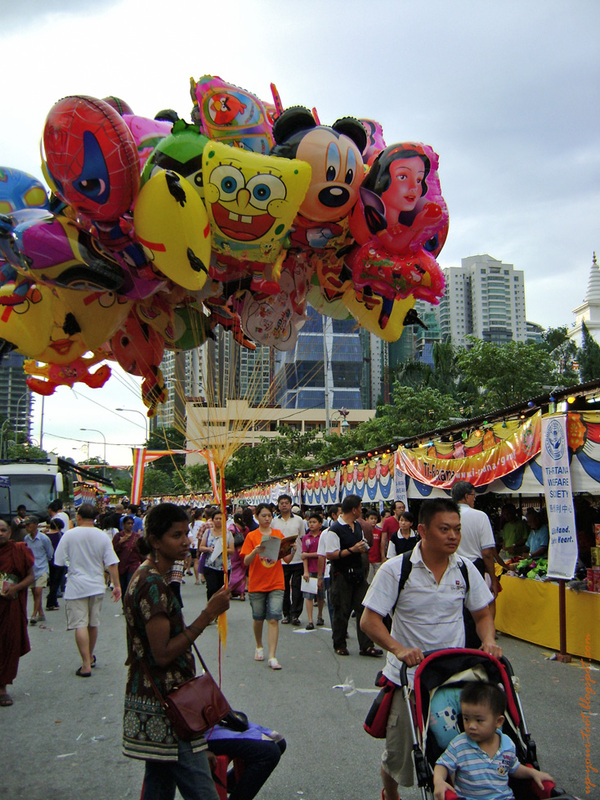 The road leading to the temple had a carnival atmosphere, with stalls and peddlers selling goods that include helium filled balloons in the shape of Angry Birds, Mickey and Minnie Mouse, Spiderman, Spongebob Squarepants, Snow White and not forgetting our local Upin & Ipin. 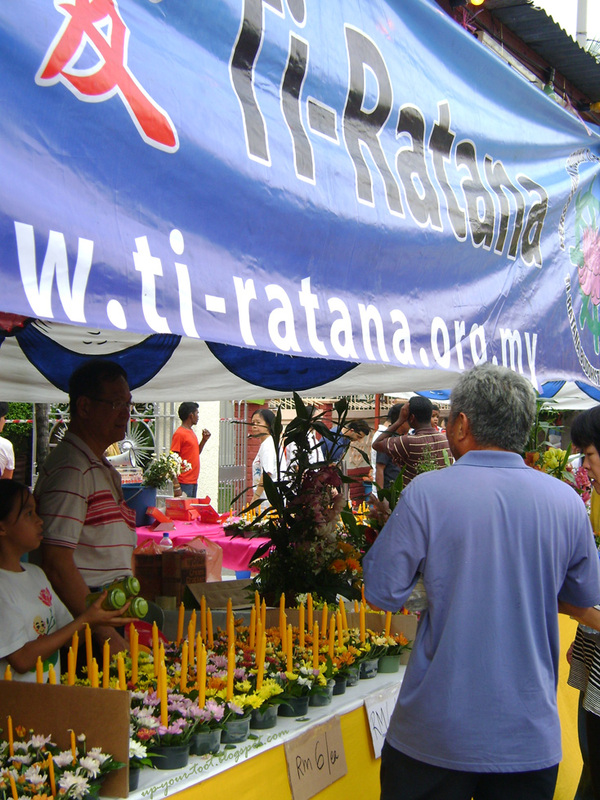 There were also stalls that sold candle stands, various decorative knick-knacks, lanterns, vegetarian food and Indian sweets. Balloons anyone? Angry Birds, Spongebob, Snow White, Spiderman, Upin and Ipin plus Mickey and Minnie. Something to cater to those with a sweet tooth - Traditional Indian sweet-cakes. 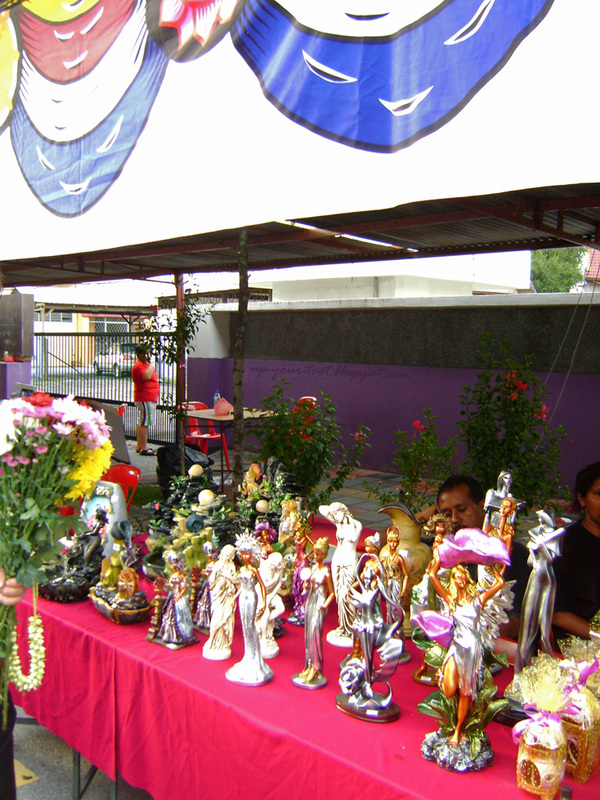 An assortment of decorative items on sale. The atmosphere was very carnival-like. 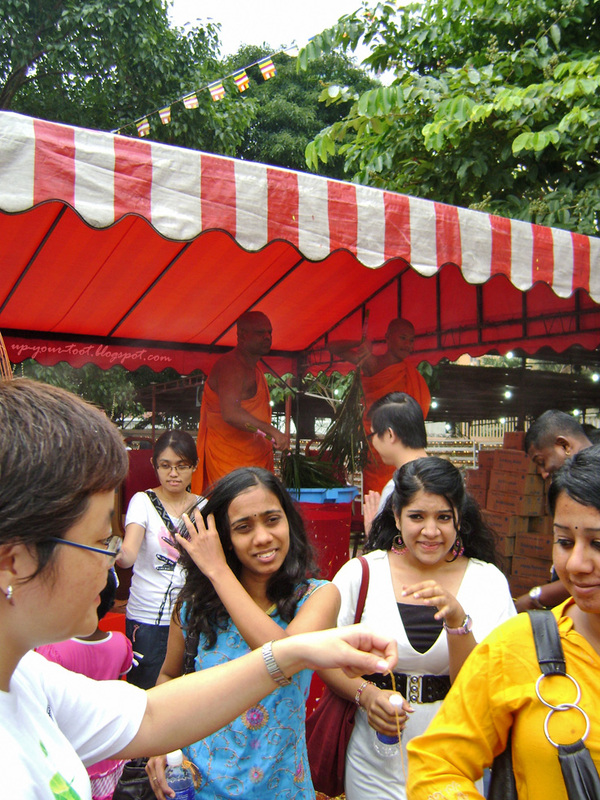 After getting a sprinkling of water from the monks at the Vihara, we decided to go off before the procession starts. As we drove off, the VIP whom is supposed to flag the procession off went by, accompanied by police escorts. There was also a float that was just making its way to the queue of floats at the rear of the temple. 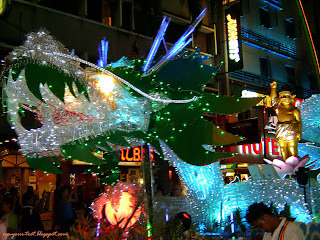 We ended up in Bukit Bintang for dinner as we know that the procession will pass through Jalan Raja Chulan and onto Jalan Bukit Bintang before turning off into Jalan Pudu to head back to the Vihara. The baby Buddha on the dragon head. The head of the dragon turns around to and fro whilst spewing smoke from its mouth. This I think is the coolest float of the Wesak Day procession. After a heavy meal at a Middle Eastern/Lebanese restaurant, we walked across the road at around 9.45pm to where BB Park is and waited for the floats to come by. Within minutes of leaving the restaurant, we could see the flashing of police cars and outriders, indicating that the floats were at the intersection of Jalan Bukit Bintang and Sultan Ismail. Slowly, the floats pass by, drawing an ever increasing crowd, especially tourist who were not aware of the procession. It was quite interesting to see the massage girls stopping their solicitation to watch the floats go by and ask for blessings from the monks. 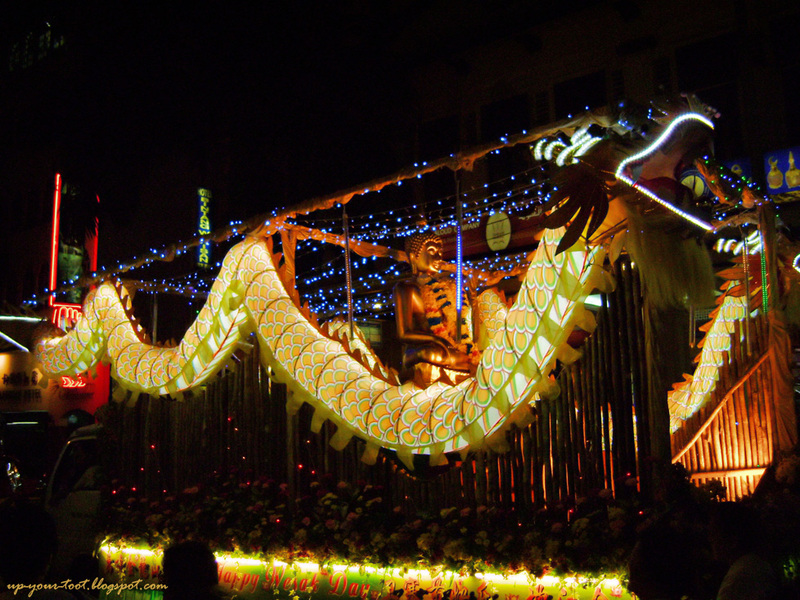 The second float in the procession - the Buddha flanked by two lit dragons. 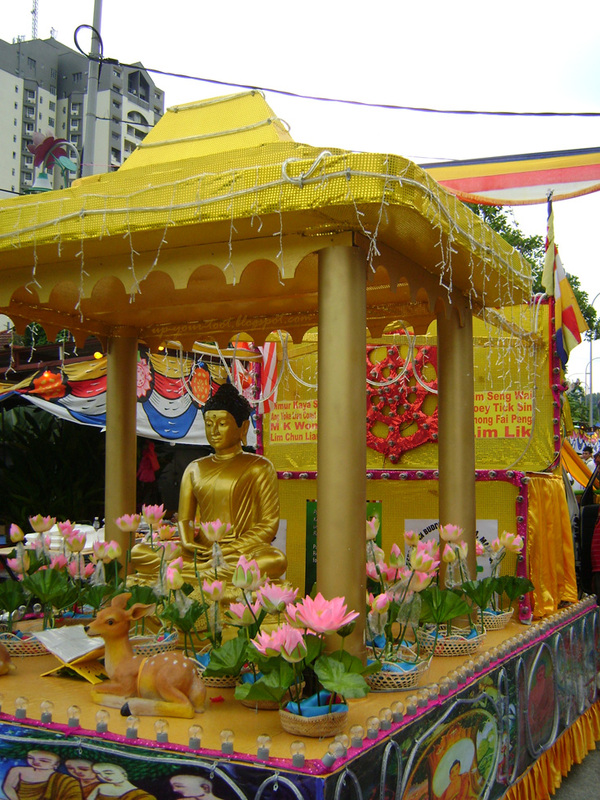 The float by Chempaka Buddhist Lodge, Petaling Jaya. 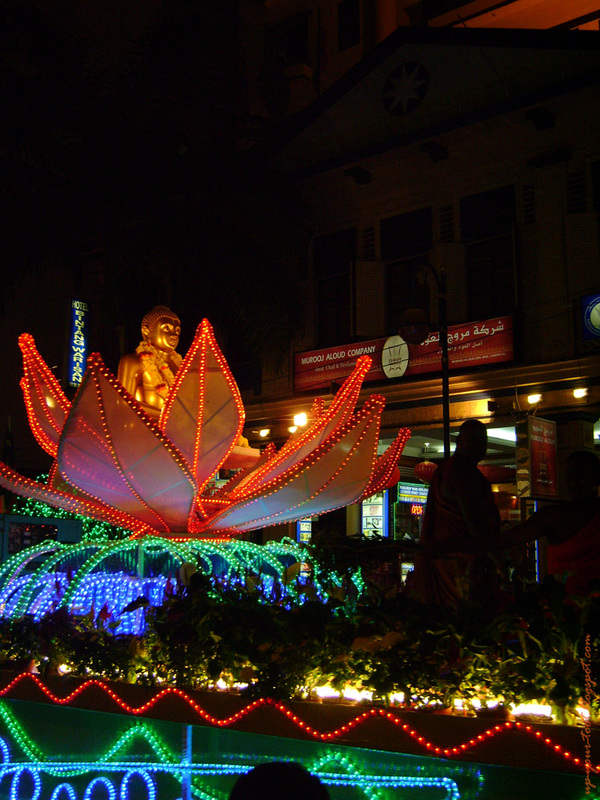 The best float I would have to say is the one by the Malaysian Buddhist Association, depicting a baby Buddha making his proclamation whilst standing on a lotus bloom that was on top of a dragon. The dragon could turn its head to and fro and spew smoke from its mouth. The thought of the baby Buddha making his final birth proclamation in BB Park instead of Lumbini Park strikes me as kind of funny. Another float with a seated Buddha flanked by flower arrangements using Alpinia purpurata, chrysanthemums and various plastic flowers. One of the bright, incandescent bulb-lit floats - they have huge generators trailing behind to supply power to all the bulbs! 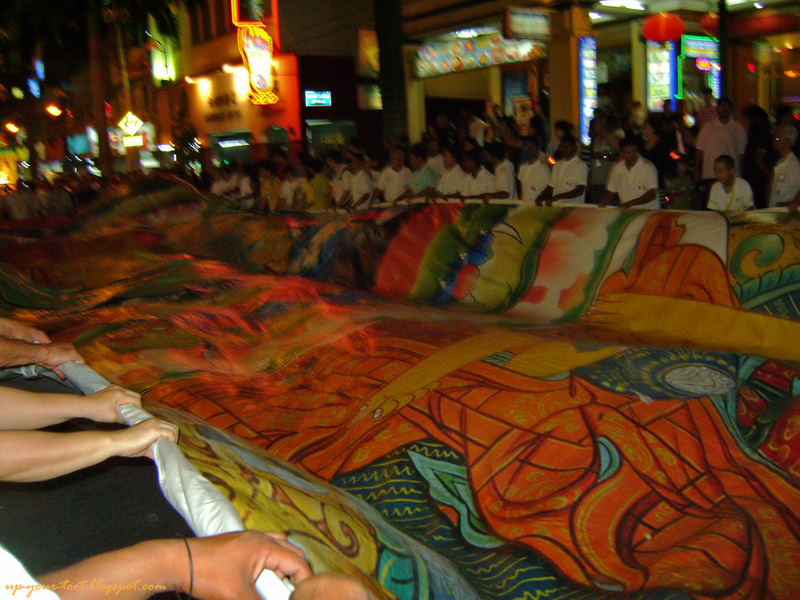 The Monthly Life Liberation Malaysia (the float that passed us at Brickfields) had a long, horizontal banner depicting the Buddha. When they stopped moving, they invited bystanders to join in the waving of the banner amidst loud cheers and cries of Malaysia Boleh! The huge banner that many people joined in to help shake and wave it amidst cheers and cries of Malaysia Boleh! 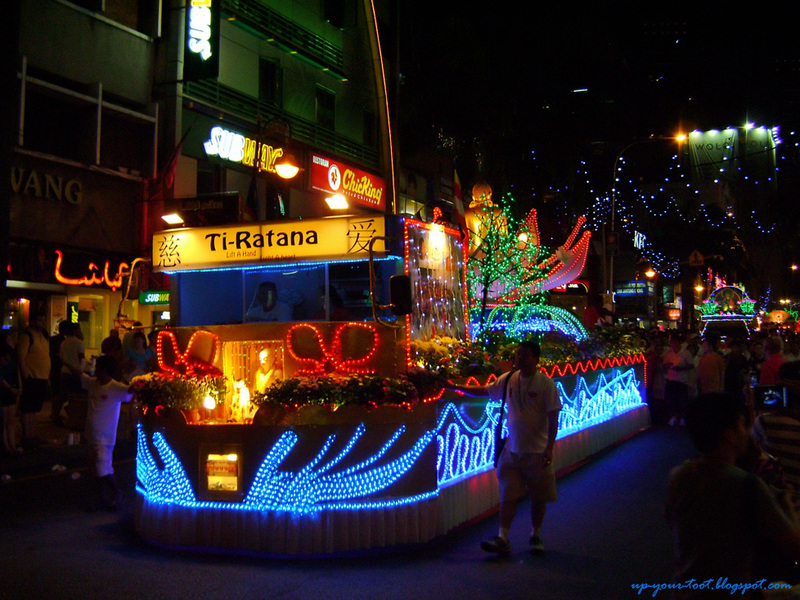 The float by Ti-Ratana Welfare Society - LED trees and LED lotus. The Jewel in the LED lotus. For those who missed out on the holy water, this was the last chance for the day. Perhaps folks at Bukit Bintang might need more than just a sprinkling of holy water. In terms of the number of devotees, involved the Wesak Day procession in KL seems to be huge when compared to those in Penang. 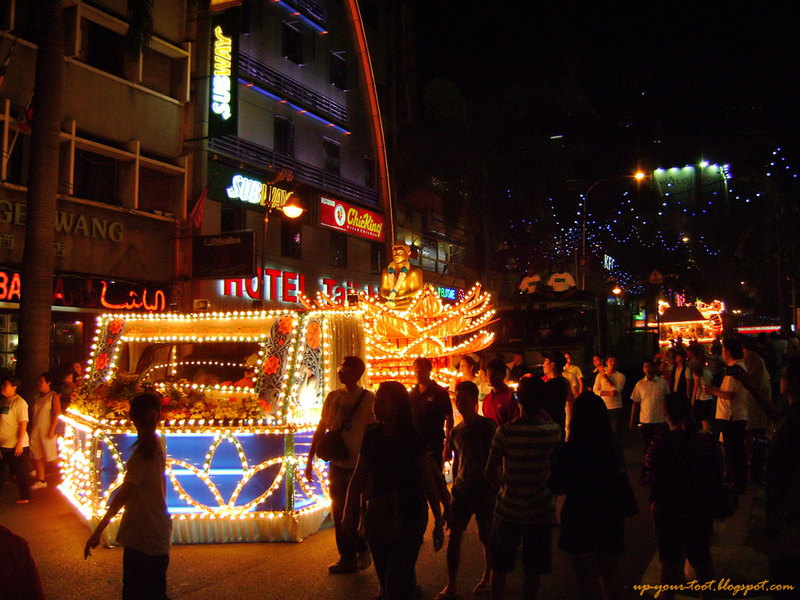 However, I honestly think floats in Penang were more attractive and sophisticated. Even so, the procession in KL is still worth seeing. After waiting for the traffic to disperse, we got out of the parking lot and headed home, smack right into KL's Saturday night traffic. Happy Wesak Day! 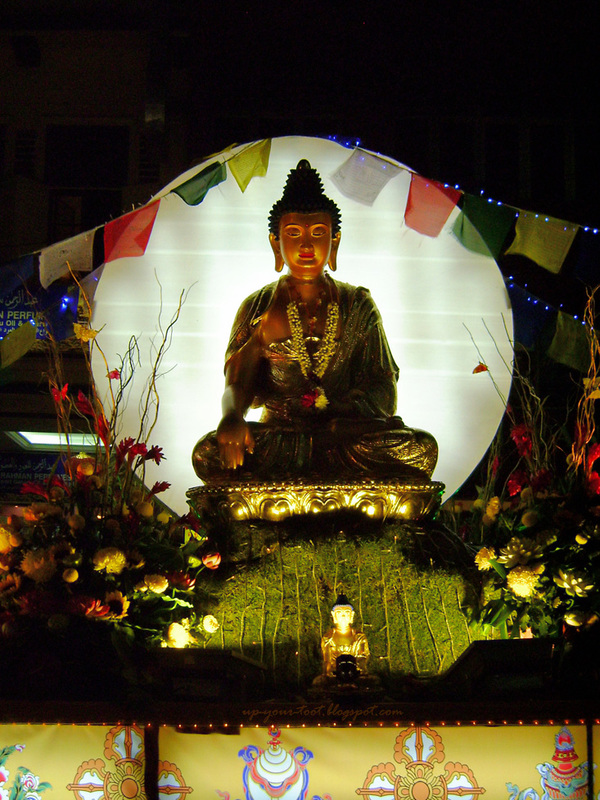 Click here to see pictures of the Vihara/Brickfields on the eve of Wesak. 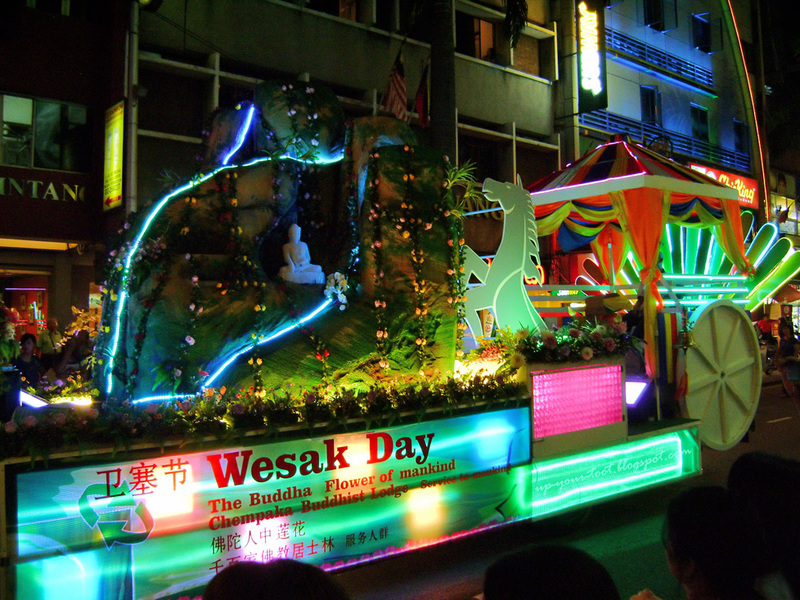 I never knew that there are float procession on Wesak day. Its really interesting to see all the design and spirit of Malaysia people. I usually avoid it since it would mean getting stuck in KL till pass 11pm, but it was good to watch. I guess it was a good way to highlight the diversity in Malaysia. Many tourist were asking around what is this procession about. Side effect from the procession; my arms are still aching from joining in waving the banner with shouts of 1Malaysia, hehe. Wow, what an eventful day. 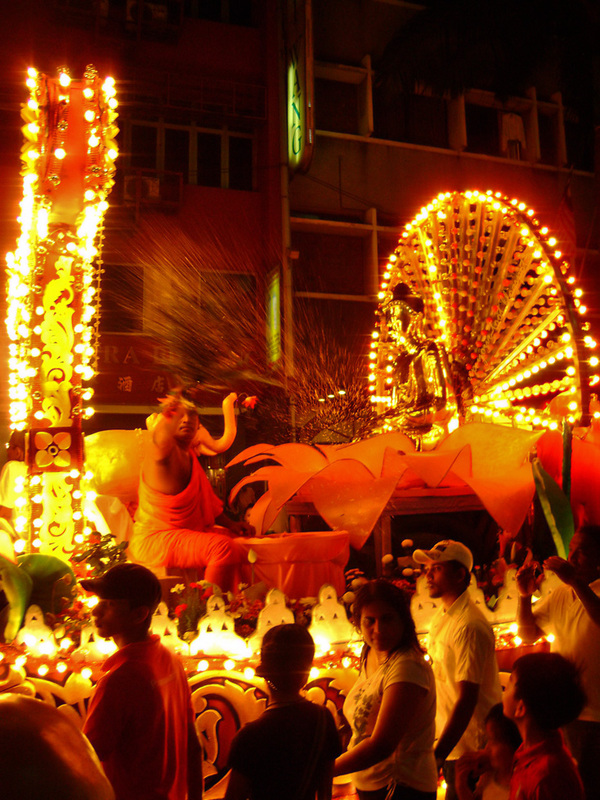 On Wesak day, I have only been to the Buddhist Maha Vihara once, and that was many years ago. The processions are very colourful and beautiful this year. So glad you posted it here. Glad you like it. This is my first time watching the procession in KL. I too usually go to smaller temples - less crowd/traffic and more peaceful.